Our energyNuclear new build projectsHinkley Point CNews and viewsBlog: What does Hinkley mean for Somerset and the South West? Blog: What does Hinkley mean for Somerset and the South West? Most people know Hinkley Point C as the first new nuclear power station in a generation. But here in Somerset and across the South West, Hinkley is known as more than just a plant that will power 6m homes. It’s also firing up people and businesses across the region. We’ve set the whole project up to benefit the local area as well as the country, and to leave a legacy long after the diggers have gone. Instead of only bringing in big multinational companies, we’ve actively got local companies involved. Since 2012, we’ve worked in partnership with the Somerset Local Authorities and Somerset Chamber of Commerce to get local businesses and communities on board. Starting with an evening talking to local business people in a Bridgwater hotel, we’ve built trust and understanding. Four years on, six local consortia have been created and have won major contracts with us. HOST, a joint venture of businesses from Taunton, Weston and Yeovil, won the c£150m contract to manage our temporary accommodation, where up to 1,500 of our workers will sleep. The 8,000 meals a day our hungry workers will get through will be provided by Somerset Larder, a coalition of seven caterers from places including Bridgwater, Langford Budville, Minehead and Yeovil. These local joint ventures have been created from scratch for the £50m+ Hinkley contract, but they’ve also won the tender to feed police officers in Bridgwater and Bristol, and are now well positioned to win contracts right across the country. That means the 150 new jobs created, and the benefits to Somerset Larder’s 30+ suppliers, will just be the tip of the local iceberg. 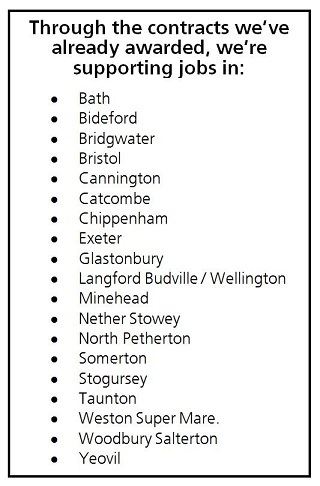 In addition, contracts with the Construction Operations Management Alliance (site utilities like water and electricity), the Somerset Infrastructure Alliance (site infrastructure including our roads), FACE (design and print) and Somerset Passenger Solutions (shuttle buses to and from the site) will support jobs in Bridgwater, Catcombe, Taunton, Weston-super-Mare, Woodbury Salterton and Yeovil. In addition to the consortia, other south west-based businesses have already won contracts, such as Chippenham’s M+W Group (design, engineering and construction) and Bideford’s TCi (GB) (building fit-outs). And there are more to come, with 3,000 businesses in Somerset and the South West already registered on our supplier database. In total, we’ve already awarded contracts worth over £465m to companies in the South West, creating over 660 jobs. Over the lifetime of the project, we’ll create around 25,000 job opportunities, around a third of which are likely to go to people in Somerset. So we’ve created the Hinkley Point C Jobs Service, which has already matched nearly 200 local people to jobs across the project. And another 900 people will be needed to operate the new power plant once it’s up and running. We’re also making sure that the people we hire have the skills they need. For example, we’ve set up the UK’s first commercial degree apprenticeship. Spending three years at university racking up thousands of pounds of debt isn’t practical for some young people, so we’re taking on up to 20 apprentices a year for five-year paid placements. They’ll join us as full-time employees, learning to manage our suppliers, and be given block releases to Bridgwater College in Somerset and the University of the West of England. And at the end of their five years, they’ll be some of the best in the business, and come out with a degree to prove it. The first cohort starts in a few weeks, and includes young people from Bridgwater, Clevedon, Glastonbury, Minehead, Nailsea, Lopen and Taunton. Overall, we’re investing £15m locally in training, education and skills, including at Bridgwater College, the Construction Skills and Innovation Centre in Cannington, and our own brand new training centre at Cannington Court. This lasting investment in Somerset’s future is vital, because Hinkley Point C is more than just a construction project, more than just a new nuclear power station. We are working together with Somerset in long-term partnership. Together we’re building the south west’s industrial capacity. We’re helping local companies grow into national businesses. We’re giving local people the skills to launch their careers. And. we are changing lives. The construction will be finished in ten years, but the significant difference we are making in terms of skills and jobs will last for many decades to come.